With their strategies and a few sharp #2s, you’re sure to do better whether you’ve got one year, one month or just one week to get ready. Just take our tiny test to start the prep process. Don’t get voted off the entrance exam island! Whats the number one thing that will help you do better on the SAT? Get familiar with the directions. Taking practice tests and familiarizing yourself with the directions helps save time on the test, says Woodward. The more you know about your enemy, the better off you’ll be. Should you plan on taking the test more than once? Bernstein says, It’s a personal choice. Leave enough time to take it again before colleges need the results in case you aren’t happy with your original score. 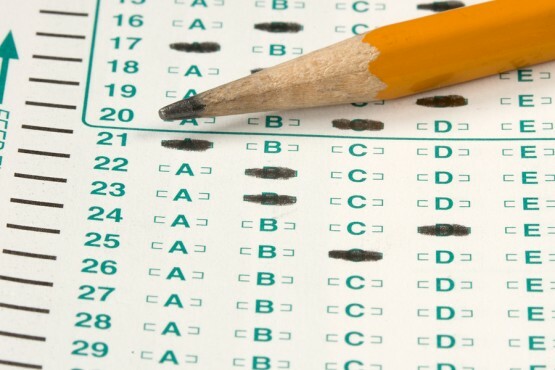 Some students see significant gains (100 points or more) the second time they take the test. What’s the biggest mistake you are most likely to make? They do not give you enough time to answer all of them and do well, says Woodward. Rack up the points by concentrating on the first two-thirds of the questions in each section. It’s all about maximizing your time and pacing yourself. Whats the easiest way to up your score? This strategy is tried and true. Focus on the actual test, not vocabulary lists and math flashcards. Buy a prep book or check one out from the library to familiarize yourself with SAT format. If you’ve got a year to get ready for the SAT. What should you start doing? The test will help you figure out how much and what you need to improve. Then you can decide if you need extra help or if you can prep yourself. Reading boosts your vocab which is key to the verbal section. With a month left to go, how should you use your time? Do all the questions in a math book. Read the dictionary every night. Take a practice SAT. Don’t worry about your weakest and strongest sections; concentrate on improving the ones in the middle. According to Bernstein, you don’t have time to master what you’re weakest in, so focus on what you can improve. Eep! The test is next week, and your friend hasn’t prepped for it. What should you suggest he or she do? Take a practice test and get used to the directions. Do yoga to center the body and mind. Forget it. It's too late to make an impact. Knowing what to expect can do a lot for your score and your piece of mind, says Bernstein. Don’t try to cram too much information or memorize things at this point, says Woodward. You aren’t going to learn anything new and you run the risk of shutting down during the test. So long as you get enough sleep the night before the test, the time you usually get up has no bearing on test day. Check what time the test will be given, and make sure your brain gets used to being awake, alert and fed at that hour, says Bernstein. Woodward also suggests one to two weeks before the test having someone come into your room early and start opening the shades. The increased light boosts chemicals in your brain that make it easier to wake up naturally. Which formulas should you memorize for the math section? You do not need to memorize any math facts. Good news: The quadratic equation and trigonometry do not appear on the SAT! However, right triangles are all over the place, so knowing the ratios of their legs will save you a ton of time. Focus on the basics and you’ll do well. Whats the best way to get ready for the verbal section? Instead of memorizing lists, which doesn’t help your long-term memory, read more newspapers and magazines, says Woodward. You get a lot of bang for your buck here, increasing your known vocabulary, cultural literacy and familiarity with different styles of writing, as well as your ability to figure out vocabulary in context. Other supplies to consider: a timepiece you can read clearly, tissues, and a snack without noisy wrapping. Dress in layers since you wont know if the room is going to be hot or cold, and leave your cell phone in the car. What would be a good test-day breakfast? Definitely eat breakfast, and make it, a mix of carbohydrates and protein. Nothing too heavy, says Woodward. A lot of sugar is bad, since you’ll crash halfway through the test, says Bernstein. What should you do the night before the test? No cramming for you! chides Woodward. If you don’t know it by now, you won’t know it by staying up all night. The best thing you can do is to get a good nights sleep. Then you’ll be ready to noodle things out! My name is Rachael Heap I’m only 12 years old but the years go by faster as you age. Considering how I’m in Jr. high I decided to take a look at what I might want to be how many tears in college it will take, and what I have to do and learn to achieve that goal. I don’t plan on pushing myself past my limit but I do plan on getting a reasonable head start. The children who are in my age group are going to be running the country some day and raising other children for the next generation so they can run the country in the future. I think it’s very important that we start making decisions on how to get “there” instead of wishing or hoping we could get “there”.